"It is hard for a man to be brave when he knows he is going to meet the devil at four o'clock." Even though they both began their careers at the movie studio that boasted the claim of "more stars than there are in the heavens" (MGM), it took nearly 20 years and a rival company to bring Frank Sinatra and Spencer Tracy together for their first and only collaboration. 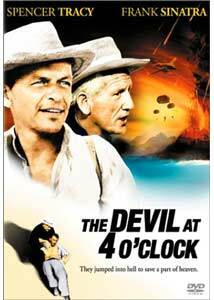 The Devil at 4 O'Clock commences in the skies over the South Pacific as a seaplane heads for the island of Talua. On board are three criminals en route to a nearby Tahitian prison and a young priest tapped as a replacement for the resident man of the cloth, Father Doonan (Tracy). After landing, the game plan for the flight crew is to drop off the young whippersnapper and head onward with the criminals the next morning. But the bad guys are given a bit of a break by Doonan, who puts them to work making roof repairs for the local children's hospital, his last act of charity before departing. While the prisoners toil, the two priests meet privately, and it becomes all too clear that religious relief hasn't arrived a minute too soon. Codgy, disillusioned and alcoholic, Doonan is no longer what you would call a candidate for the Father Flanagan award (nice ironic twist on a classic Tracy role). In time, young Father Perreau (Kerwin Matthews) learns that Doonan's demons were set into motion by the locals, who blame him for the drop in tourism due to the hospital's primary focus: sick children affected with the misunderstood disease of leprosy. In protest, they deserted his church. Meanwhile, the convicts, headed by ringleader Harry (Sinatra), are plotting an escape. However, two factors thwart their plans: Love and Nature. For starters, our cocky, devil-may-care antagonist has his heart melted by a blind island girl (Barbara Luna). Before love can bloom, tragedy strikes as a major earthquake rocks Talua to its very foundation, sending residents and visitors scurrying for a way off the island before a long hibernating volcano strikes its final blow. If The Devil at 4 O'Clock were nothing more than mediocre, it would still merit more than a passing footnote because of the unusual teaming of two screen legends. But the contrast of Sinatra's ring-a-ding-ding looseness and Tracy's steely determination makes for great entertainment, as their conviction to the material helps smooth over some of the occasional tedious moments. Terrific supporting cast is a big plus with nice performances by Luna, Matthews, Cathy Lewis, Martin Brandt and a very young Bernie Hamilton (Captain Dobey from television's Starsky and Hutch). Image Transfer Review: Save for a few optical effects shots and a handful of transitions between scenes, this transfer is as smokin' as that Talua volcano. Remarkable color, perfect sharpness and terrific contrast courtesy of well cared for source materials. Also applaudable is Columbia's decision to present the film in dual layer format—rare for classic movies running slightly past the two-hour running mark; a move that only enhances an already good looking picture. Audio Transfer Review: On par with the visuals in terms of quality, the audio track has easily understandable dialogue and very impressive low frequencies that come into play during both the film's action-adventure sequences and rousing score (by the underrated George Duning). Extremely impressive for a monophonic track that at times sounds almost stereo-like in delivery (but not in a false way); if all single-channel soundtracks could sound this good, I would be one happy camper. Extras Review: Along with the film's slightly worn original trailer (which should make you better appreciate Columbia's stellar re-mastering work) are coming attractions for Tracy's The Last Hurrah and Sinatra's From Here to Eternity. An inspired pairing of two Hollywood icons combined with a compelling, believable story that should satisfy action/adventure fans and drama lovers. Another great job from the most underrated studio supporting the release of classic films from the past.